Best known for Billboard-charted hits like “Hard” and “Lemonade,” Scottish-born DJ/producer SOPHIE has a special “hyperpop” set prepared for his New Orleans crowd tomorrow night at Joy Theater for this Decadence-filled weekend. Samuel Long, stage name SOPHIE, compares his ideal pop music set to a thrill-happy rollercoaster ride. For Long, that perfect ride would be complete with high-speed flips, flashy strobes, and an erratic slow-stop-speed-ahead pace that keeps the crowd both physically and figuratively on their toes from start to finish. Long as an individual is elusive at best, with few personal details known besides his association with London-based label PC Music. But his live sets are in-your-face dares to stop dancing and smiling while inevitably enjoying the experience. Whether or not you’re familiar with hits like “Lemonade,” SOPHIE’s inimitable usage and creation of noise samples is an indisputable hallmark of his discography. This sound is epitomized by tracks like “Bipp” and “MSMSMSM,” off his 2015 recording debut Product. SOPHIE’s own tracks also often feature high-pitched, sweetheart vocals that ground these often wacky combinations of sounds in an addictive pop aesthetic. If his own tracks weren’t enough, SOPHIE has also lent some mind-bending interludes to hits like the title track off Cashmere Cat’s 2017 release, 9. On “9 (After Coachella),” SOPHIE crafted an intensely zany and dissonant bridge that perfectly complements yet also juxtaposes the verses’ sugar-pop vocals, courtesy of MØ. Long has also collaborated in the past with Charli XCX on singles and studio albums like her Vroom Vroom EP and “After the Afterparty” featuring Lil Yachty—not to mention artists like Vince Staples, PC Music label mate A.G. Cook and the Madonna. 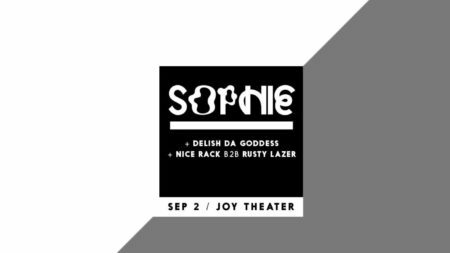 But before SOPHIE can even take the stage at the Joy tomorrow night, the event kicks off at 10 p.m. with a back-to-back DJ set featuring Nice Rack and Rusty Lazer. That high-energy b2b set will be followed by beloved New Orleans’ rap queen Delish Da Goddess providing direct support on what’s to be an incredible Decadence-fueled live set this weekend. And for all you fellow music producers out there, SOPHIE teamed up with Splice Sounds to release his first sample pack, “SOPHIE Samples” just earlier this week–don’t sleep on adding these FX to your collection! Head here to buy tickets to Sophie at the Joy Theater in New Orleans!